The Beauty of the Color Blue! The color Blue represents distance; oceans, skies, and the heavens. It is a cool, calming color that makes you feel at ease and means friendship. All of these things remind me of my beautiful Island birthplace - Bermuda! Here's some first hand information that only living there can give you. Bermuda is where I was born and where I lived and worked in the Tourism Industry for 46 years. Let me take you through some of the do's and don'ts! You could get lost while lazing about on the beaches of though Bermuda, or cruising around on a catamaran sipping rum Swizzle, anyone could! Some however have been lost forever in the Bermuda Triangle! What do locals say about the Triangle? The disappearances in the Bermuda Triangle as seen by someone who lives there. Here are some detailed accounts ao ships and airplanes that have disappeared in the Bermuda Triangle. Facts, figures and a host of information about the Bermuda Triangle and various events that have occurred within it. One of the world's first pirates was a Bermudian by the name of Henry Jennings. He established the base which became the home port for the likes of Blackbeard and other more famous pirates! Lots of trivia and fun facts about the island of Bermuda, including Bermuda Shorts, Bermuda Grass, the Bermuda Sloop and even Blackbeard the Pirate! Bermuda has some of the best beaches in the world. The color blue surrounds you as you bask on beautiful pink sand beaches under a sunny blue sky, and cool yourself in the bluest water you've ever laid eyes on. 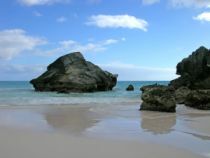 Visit our favorite Bermuda beaches by clicking on the link below. Calypso music is also represented by the color Blue. Calypso is a fun music, celebrating life, the struggle for freedom from oppression as well as exuding passion for the love between the sexes and generally just having a good time. If you want to move and groove at your next party, play some Calypso, I guarantee you'll shake your booty, or someone will shake it for you! Bermuda's earliest settlers were some of the first colonial pirates, paving the way for the likes of Blackbeard and Calico Jack Rackham.